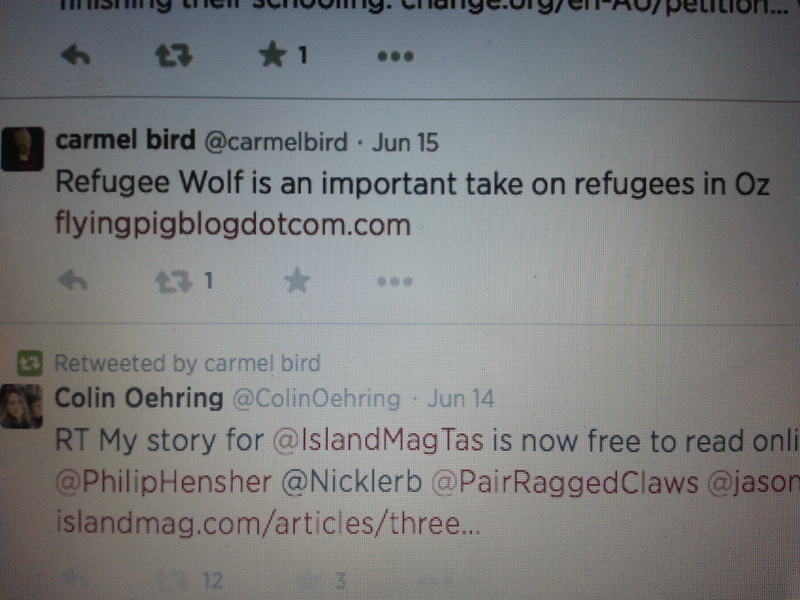 Carmel Bird Great Oz writer endorses Refugee Wolf! Last week was a wonderful week in my creative journey. I attended the inaugural Australian Fairy Tale Society (AFTS) conference. President Reilly McCarron and Vice President Jo Henwood and a whole lot of committed Fairy Talers did a great job on the day. Belinda Calderone from The Monash Fairy Salon captured all of the presenters and happenings in her blog. I immensely enjoyed the presentations and met a great group of people during the day and made new friends. The highlight was when I was asked by Reilly to join a panel to discuss the cultural editing of fairy tales. I sat next to the prolific Oz writer Kate Forsyth (Bitter Greens) and story teller Jenni Scargill-Strong (The Story Tree Company) and Dr Rebecca-Anne Do Rozario (Monash Uni). Later, the great Oz writer Carmel Bird (Red Shoes) asked me to read the first page of Refugee Wolf. That was the first public reading of it and I felt that everyone including the audience shared a little moment of history! Carmel bought a copy of Refugee Wolf and just the other day she tweeted about it! I encourage all writers to have a go at reinventing and exploring fairy tales in their work. You might find something that taps into your subconscious and maybe your soul and write an enriching story.